Established in 2004 as ‘Hosting media,’ Hostinger has extended to become well-known web hosting provider. It has over 29 million customers & an average of 20,000 new users sign-up every day – approximately a new customer every five seconds. It has offices all over the world. Headquartered in Lithuania, the company has a team of around 250 employees. And maintains some international offices along with a strong force of remote workers to make sure Hostinger services and support will always be running and responsive. As a result, Hostinger can offer around-the-clock live chat support and a 99.9% service uptime guarantee. You’ll get a wide range of features and benefits to operate a smooth WordPress blog or website. It looks like they are providing remarkable features. So, to learn about them let’s talk about all the stuff they have below for details. 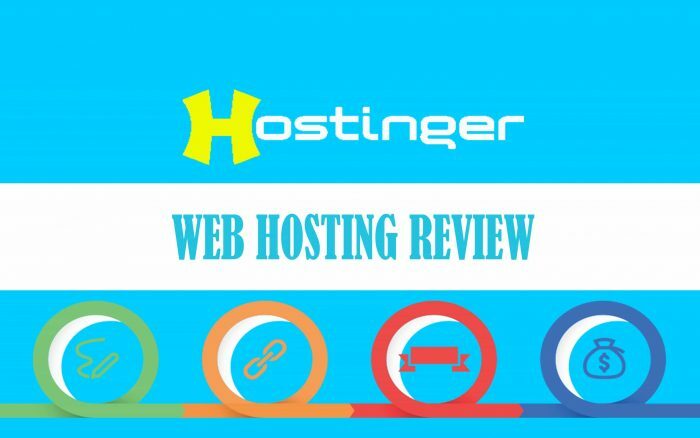 Hostinger Web Hosting Reviews: Is it Worth it? You need a website so what you will do? If you buy a web hosting & a domain name, it’ll cost you approximately $50 to $80 annually, depends upon the quality of web hosting. Usually, a domain registration costs $8 ~ $15/year and hosting $2 to $10 monthly. 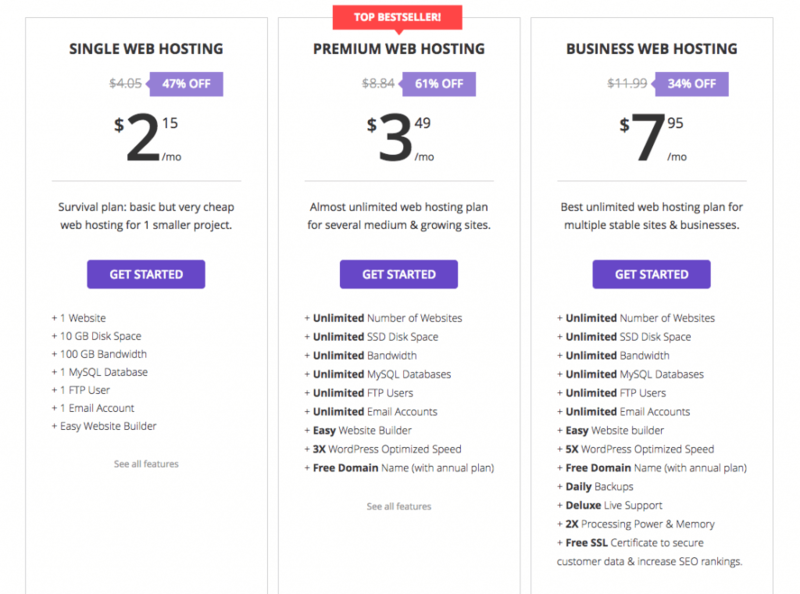 Consider if you get web hosting at just $2.15 per month, however you have to choose a three-year subscription. You can indeed get a free domain name which is available in higher plans, but the basic one consists of a free sub-domain. Hostinger provides free domain registration for Premium and Business plans. Although, it’s not new as every good host offers the similar deal when you purchase web hosting annually. 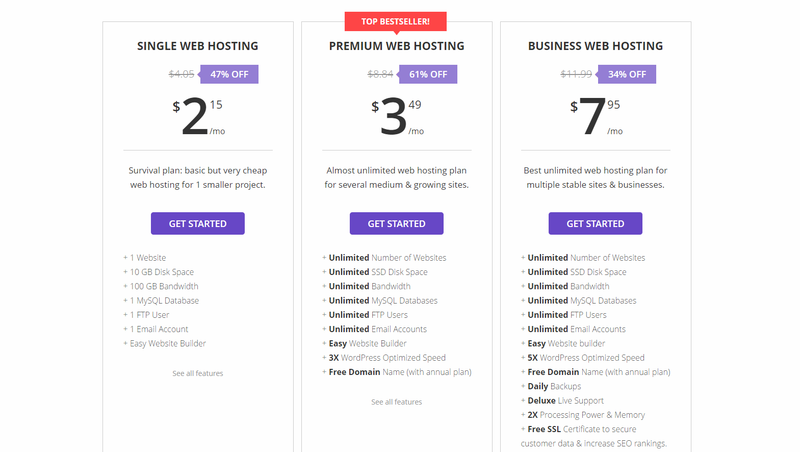 If you select a premium hosting plan, the price would be nearly $3.49 monthly for a three-year subscription which is quite affordable. Remember, they only offer free registration for .com, .net, .info, and .xyz, and yet it’s great opportunity to get a free website name. It’s all useless if your website contains good content but is down against rival sites, Isn’t it? Consideration of server uptime is probably the most significant and crucial factors whenever choosing a hosting company. Server downtime happened, and I have experienced that with the majority of the web hosting companies which I have used. But you don’t have to worry because down times are small and acceptable. Always remember one thing; you must buy web hosting from the company who claims to deliver maximum server time. However, many of the customers using a free account to host website often report of frequent downtimes. But don’t forget it’s a free service and quality comes with money. There could be limitations when you use free service, so for highest server-uptime, Hostinger have got great servers to provide 99.9% uptime for all packages. Hostinger uses a customized control panel where things are simplified so that you can manage website easily. Even a beginner can simply use it, & all possible functions are available consisting of information about bandwidth, DNS records, Email accounts, CPU, & storage usage, etc. Creating sub-domains, database, and park domains are simple. There are numerous additional features available within cPanel such as managing database & email accounts, file managers, FTP account, & IP blocker. Over 2 million websites have already been created through Hostinger’s free tool, called Zyro. The drag-and-drop interface can be launched in one click from customers’ hosting account management panel. They provide hundreds of CMS scripts such as Joomla, WordPress, etc. with one-click auto install functionality. So, newcomers can install WordPress by using One-Click installer within 2 minutes. You will find hundreds of free template which can be customized using Zyro drag and drop builder. Following that, Zyro’s WYSIWYG platform automatically guides users through several steps of adding and editing text, organizing navigational menus, and managing SEO settings. While some drag-and-drop editors can make adding and aligning elements remarkably complicated, Zyro assists users with images, text boxes, and more snap to a grid – making sure your design has got the greatest impact. Live Chat and Ticketing System are the main methods of contact customer assistance which is best regarding web hosting. It’s quick, Live chat is an excellent solution to communicate with the technical team as soon as you face any issue. The customer support will be reached anytime as they offer 24/7 email support and instant live chat. Further, their response time to emails is incredible as they respond very quickly. They reply within few minutes to a couple of hours to fix your issues as quickly as possible. There is also knowledgeable library where articles about features, troubleshooting manuals, & other technical information linked to hosting issues are available. The quality and responsiveness of hosting service teams often suffer when companies scale to a global size and customer base, but not Hostinger. People found its live chat agents being responsive, well-informed, and very helpful. Hostinger’s database of tutorials varies from basic guidelines for helping beginners start a blog on WordPress, to helping professional developers configure Docker and utilize the WordPress API. Customers will find much more information in the company’s well-organized knowledgebase or possibly through submitting an online ticket. With Hostinger employees spread worldwide, somebody is awake and ready to answer your queries. 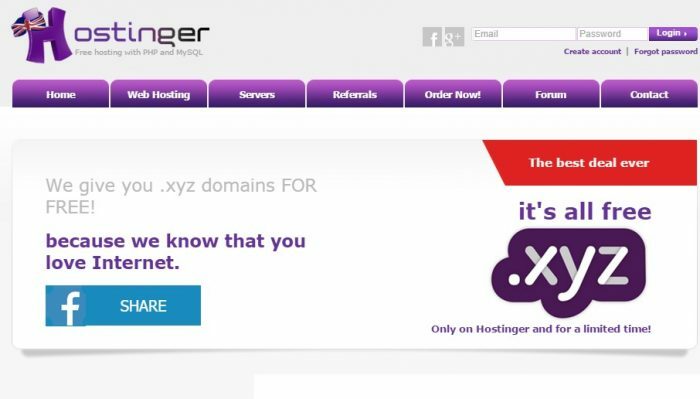 Hostinger is an ICANN approved domain registrar using which you can buy a domain just at $9.99 for .net, $8.99 for .com, and $11.99 for .biz extension. .Com TLD price appears to be significantly lower when compared with many other registrars. I will say they are the cheap domain registrar. Searching for another extension? Then you could get .xyz domain name only at $0.99/year. Although one domain name registration is available free of charge to those who sign up for Business shared hosting plans or annual Premium, Hostinger makes added registrations ultra-affordable. The domains with .net extensions and .com cost less than $10 yearly, while .org and .biz domains are about $12 per year. Customers of the two higher shared hosting services can also enjoy unlimited subdomains and parked domains, which makes it simple to create a robust portfolio of web properties. Hostinger transfers already bought domains to your new account extremely easy through the ultra-intuitive control panel. This web hosting provides almost all types of web hosting such as shared, VPS, cloud, and WordPress hosting packages. 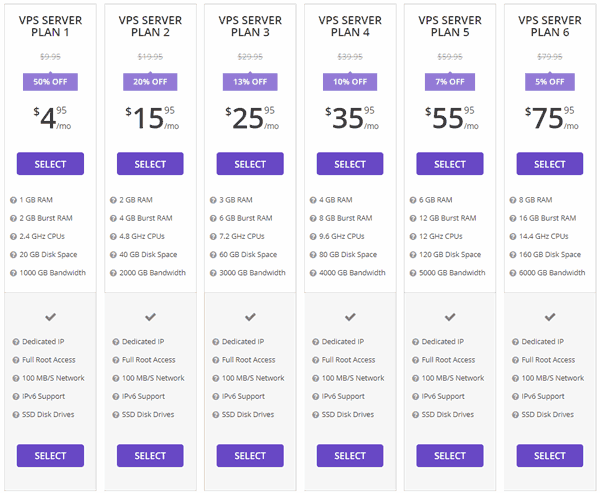 All plans are divided into sub-plans such as Cloud VPS hosting categorized into six different plans, and the shared package has Single, Premium, and Business. You will get an affordable and cheap WordPress hosting with a lot of features including unmetered hosting, free domain, custom Cpanel, unlimited bandwidth, etc. Here, you can see the concise information about plans and prices for all plans. As I mentioned earlier, this one divided into three plans, Single, Premium, and Business plan. 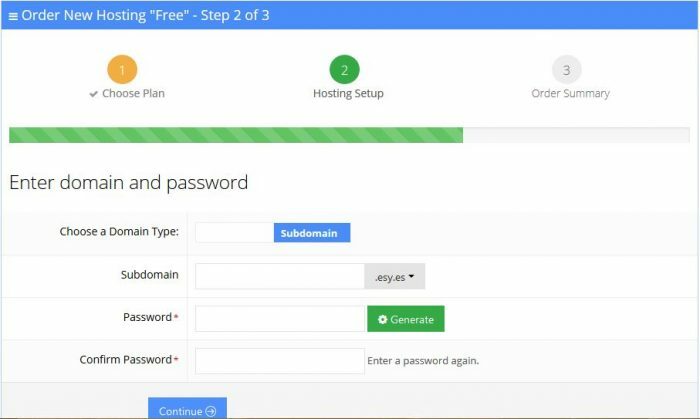 With “Starter” plan, you’ll get free domain name, 100 GB bandwidth, 10 GB storage, premium technical support, and one Email account along with lots of other features. It allows you to host one website. To get unmetered bandwidth and data storage, you have to upgrade to Premium or Business package. If you only wish to work on Hostinger then choosing “Single” plan will be a great option, and you will have to to pay few dollars per month. All of the packages include DNS Manager, auto installer scripts, Website builder, Weekly backups (Business plan), Email account manager, Domain redirects, and FTP account. Thus, you will get everything which is required to run a website efficiently. Besides Single plan, you will get SSD based hosting storage that will increase your site in term of speed. So now, if you wish to avail FREE SSL certificate, double performance, daily backups, WordPress optimized speed, and Deluxe support then you should go for “Business” package. It also supports unlimited domain hosting & unlimited SSD hosting. You will be able to create unlimited email accounts, databases, and FTP users. For less than $5 per month, customers will benefit from unlimited features, optimal hardware, and better-than-average security programs. During setting up a new hosting account, users will be asked if they want to install WordPress right after they log into the account management portal. Hostinger provides six hosting plans in Cloud VPS so that you can select any plan as per your requirements. Prices are quite low as compared to features they are offering. They use most recent technologies including SSD drives to offer stable and reliable support. Enterprise data back-up is yet another best feature, and you may recover information anytime you want. 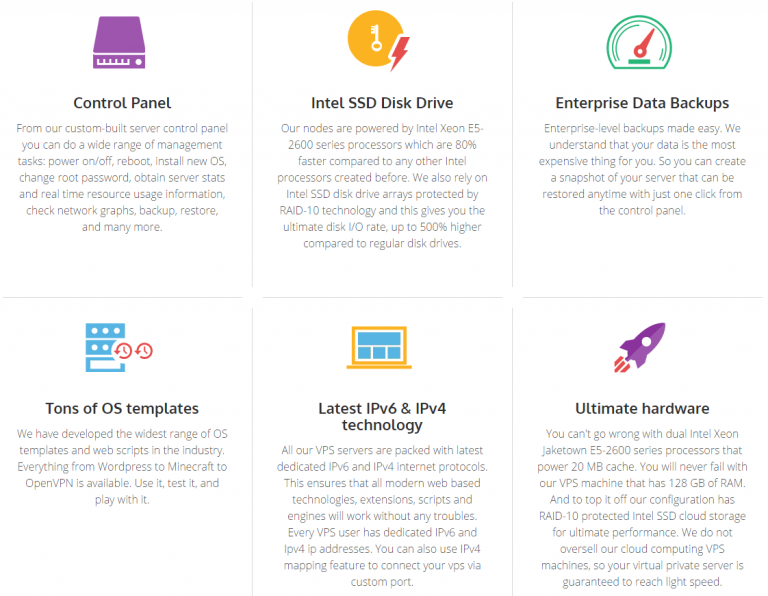 Check also the benefits of VPS hosting. Further, there exists plenty of OS options available that allow you to operate a particular software that is not available on the shared hosting plan. Hostinger provides IPv6, IPv4, RAID protection, Xeon processor, full control of root and real-time usage information and also network statistics graph. Additionally, they provide dedicated IP address in every single VPS hosting plan. Cloud hosting provided by them is identical to VPS. Thus there isn’t any huge difference. They offer affordable cloud server plans to enjoy server performance & improved speed without paying high fees. Check out below the image for prices and all sorts of specifications you’ll receive from every package. Customers who subscribe to either of the top two shared hosting plans enjoy unlimited email accounts, including free of cost. Website owners can efficiently manage accounts as well as access webmail along with other email features from the Cpanel. Email features include the ability to set email sending and autoresponders, along with editing mail exchanger information. Administrators could enable or disable their account’s Sendmail, SMTP or POP3/IMAP services. Probably the most exciting email features Hostinger offers is the ability to forward all emails sent to a customer’s domain, no matter whether the email account exists. Catch-all emails look after incorrectly spelled addresses and ensure users do not skip a single message. You can acquire hosting service using various payment methods such as Visa Card, Paypal, MasterCard, Discover, Bitcoin, Amex, Maestro, and JCB, etc. Operating a hosting account is the least favorite parts of owning and managing a website. Each host offers a different interface for clients to control their billing information and hosting subscriptions. And each company consists of different layouts, access levels, and services. In addition to cPanel, customers sometimes have trouble knowing where to look to achieve various tasks. Not so with Hostinger. The company has generated well-known management interface which puts all the hosting services in a single accessible, user-friendly package. Although cPanel is regarded as gold standard, we did not miss it at all when testing the Hostinger services. Hostinger provides the features that you can get from all popular hosting service such as SiteGround, BlueHost, or InMotion at very competitive prices. If you compare Hostinger with BlueHost, you’ll find that BlueHost is quite similar to Hostinger, & both companies have millions of customers globally with a good reputation. Hostinger is low-cost hosting service that provides everything which is necessary to operate a smooth WordPress blog or website. But they are still offering industry standard 30 days money-back guarantee to gain customers faith. You could request the refund at any time within these days without having to worry about losing money. Now, this is an essential part of this Hostinger Review, Is it advisable to use? Actually, if you compare prices, storage, benefits, & features with other companies, then Hostinger offer you lot of products at affordable prices. It appears like Hostinger provides enough benefits and features at the considerably lower prices when compared with other brands. You’ll have to subscribe to at least 3-year hosting plan to get the maximum discount. However it is normal for hosting, and nearly every host utilize this marketing strategy that helps you save money, making more profit. You can also check my another article on Bluehost reviews. Those who have plans to keep the website for an extended period, select a 3-year plan for bigger savings. At the same time, you could go for a yearly plan which I don’t suggest as it doesn’t come with a free domain name. In either case, you’ll get a good quality hosting with some features but at low cost. Despite the fact that, over 29 million people worldwide believe in Hostinger to provide reliable and high-performing services & support, the company does not have the same name recognition as other well-known and US-based hosting providers. Nevertheless, the Hostinger offers around-the-clock assistance, SSD-powered hosting, & economic domain name registrations on par with the best. Combined with company’s outstanding control panel, we wholeheartedly recommend Hostinger to prospective customers seeking a choice off the beaten path.